The aerial part of perennial herbaceous plant Artemisia scoparia Waldst. et Kit or A. capillaris Thunb. of family Compositae. Collected in spring when the young plant is 6~10 cm high or in autumn when the bud is mature. The one collected in spring is called Mian Yin Chen, the one collected in autumn is called Yin Chen Hao. Mian Yin Chen is faint scent in smell and slightly bitter in taste. Yin Chen Hao is aroma in smell and slightly bitter in taste. The best Mian Yin Chen is tender, soft in quality, green in colour, with fine-hair and aroma. Get rid of impurity and old stem, twist up or cut up, unprocessed. Bitter, pungent and slightly cold, spleen, stomach, liver and gallbladder meridians entered. Excrete dampness and alleviate jaundice, clear heat and remove toxicity. It is good at clearing damp-heat from spleen, stomach, liver and gallbladder by inducing diuresis and also has the actions of promoting bile excretion and alleviating jaundice, so it is the essential herb for jaundice especially jaundice of damp-heat accumulated in liver and gallbladder. 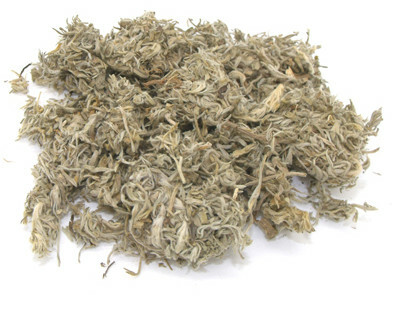 For yang jaundice manifested as brilliant yellowish skin and eyes, and dark yellow and scanty urine, it is usually combined with damp-heat clearing herbs. For instance, it is combined with Zhi Zi and Da Huang in Yin Chen Hao Tang from Shang Han Lun. 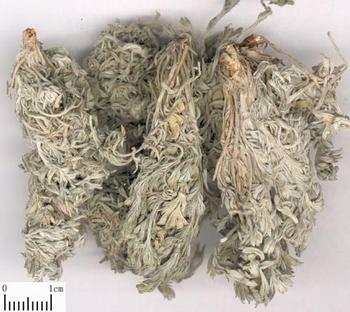 For jaundice of dominant damp type with heat manifested as obvious dysuria, it is usually combined with the damp-excreting and diuresis-inducing herbs. For instance, it is combined with Fu Ling, Zhu Ling and Ze Xie in Yin Chen Wu Ling San from Jin Kui Yao Lue. For yin jaundice due to spleen deficiency and cold-damp stagnation manifested as dull yellow, aversion to cold and abdominal distention, it should be combined with the interior-warming herbs. For instance, it is combined with Fu Zi and Gan Jiang in Yin Chen Si Ni Tang from Wei Sheng Bao Jian (Valuable Reference of Public Health). It can not only excrete damp, but also clear heat and remove toxicity, and "the aroma can disperse" and "connect skin and hair", so it is indicated for eczema and itching due to damp-heat accumulation. It is usually combined with the heat-clearing, damp-drying and wind-expelling herbs. For instance, it is combined with Huang Bai, Ku Shen and Di Fu Zi from Qian Jin Yao Fang. Decoct 6～l5 g. Proper dosage is for external application, or be washed with decoction. It is contraindicated for jaundice with yellowish skin due to accumulation of blood or sallow yellow due to blood deficiency.